Improving Intake with the Dysphagia Diet - Medtrition, Inc. I t is estimated that one in twenty- five adults will experience a swallowing problem (dysphagia) in the US. While diagnosis and treatment may vary, intervention and symptom management remain fairly consistent. Dietary intervention is often dependent upon the origin of swallowing problem, but most commonly includes a modification of food texture and beverage thickness to reduce risk of complication. Common complications include dehydration, malnutrition, choking, and aspiration pneumonia among others. Unfortunately, intervention does not come without its own challenges. Historic observation and research has shown that there can be significant variation in modifying liquids through the clinical care team. This may also translate to meal preparation and service in the culinary department who are often responsible for following the dysphagia intervention guidelines instated at each facility. While new intervention for dysphagia diet standardization is in progress, many are still utilizing a subjective approach that can put patients at risk. Unstandardized recipes for modifying food textures, holding temperatures and plate to service time variances can all impact the intervention process and the safety of the patient. In addition to these challenges, facilities also encounter issues with meal compliance, acceptance, and patient dignity. 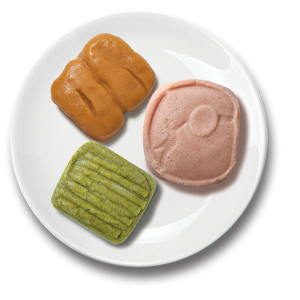 Because puréed and modified consistency foods are often unappealing to the eye, patient intake and compliance often suffer. Overtime this can lead to dehydration, weight loss and malnutrition as well as other complications related to poor intake and nutritional status. Cafe PureeTM provides the modified consistency that patients require to help meet the necessary intervention standards. These dimensional purées are made from real fruits, vegetables and proteins to provide a product that not only taste like real food but look like real food. Shaped purees provide a sense of dignity, improve nutritional intake, and reduce the feeling of isolation often associated with a modified consistency diet. With the actual food as the first ingredient to each puree, patients feel as though they are eating the real food item because it actually is the real food. In a population that struggles with intake, we are able to provide a nutrient and calorie dense answer to the challenges that this population faces daily. These purees also ensure that patients are getting the intervention they have been prescribed because each product is manufactured to consistency specifications, reducing variations with food textures and and beverage thickness. This significantly reduces safety issues that are often associated with this patient population as well. Café purée’s versatility enables endless meal combinations to serve a diverse audience with even the most specific food preferences. With items like bow tie pasta and white rice, which are usually off limits for pureed and modified diet interventions, our items can add diversity to an often-stark menu rotation. Breakfast items, fruits and vegetables and even desserts, Café Puree provides the variety the patients desire with the safety and consistency that clinicians require. Kulikowski, J. (2008). Focus on caregiving. Dysphagia in assisted living. 34(12), 37-42. Betz M, Coltman A, Peterson S, Sowa D, Improved Calorie and Protein Intake Following Implementation of Formed Pureed Food. Poster presented at: ASPEN CNW 15; March, 2015; Long Beach, California. This entry was posted in Blog on August 6, 2018 by Karen Sudders.